So many of my female patients are shocked to hear I don’t approve of their flats. Listen, they can often be the lesser of two evils when compared to sky-high stiletto heels, but that doesn’t mean that all flats are created equal. Not all flats are BAD. Take a look at this image below. Do these look like they fit? Well, they ARE the patient’s usual shoe size. If she went up a size, she would walk out of them. If she went down a size, her big toenail would pop a hole in the toebox. So, if this is her correct size, why don’t those shoes work for her? You can see a tailor’s bunion popping out on each side of the shoe and that makes for a very uncomfortable fit. There is literally no room in the toebox of this shoe. Even though the shape is slightly rounded, her toenail is firmly pressed against the top of the shoe and she can’t wiggle her toes. Blisters can form on the back of the heel or sides when shoes are too tight. Too tight shoes can also lead to a painful ‘pump bump’. 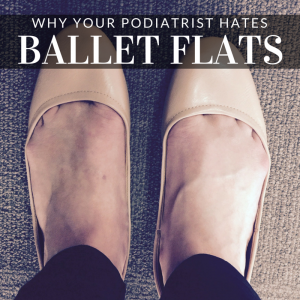 Did you know that ballet flats can lead to an increase in ingrown toenails? True. Some flats put immense pressure on the toes and cause the nails to bend and grow inward. This leads to an ingorwn toenail, which has the potential to become a bone infection. If they have one of the three problems listed above, I would toss those shoes. Look for flats that have built in arch support. Make sure to look for styles with a rounded or square toe. We stock a large range of woman’s fashion shoes, that not only look stylish but will keep your feet happy too. If you’re curious about how your shoes stack up, bring them in! We’ll do a little shoe education with you and test out your shoes for you. “Just be smart about it” as I always say.